Thordon molded stave rudder bearings. According to the company, wear figures indicate that the bearing can reasonably be ex- pected to last as long as the ves- sel. Thordon, a resilient-elasto- meric product, is a replacement for phenolic rudder stock stave bearings. Among the test results were: steering torque values reduced 30 percent, and the bearings op- erated with water, oil, or grease lubrication, or in the dry condi- tion. Aided Operations Research Fa- cility (CAORF). 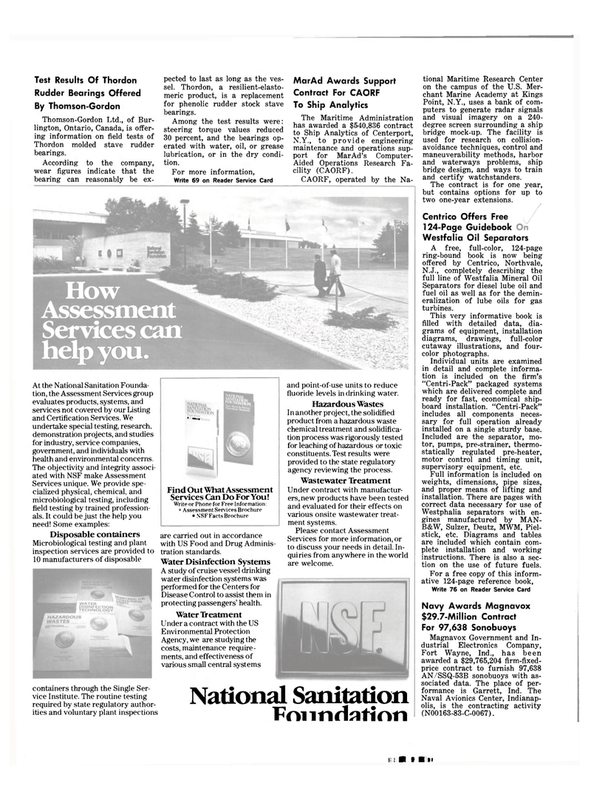 At the National Sanitation Founda- tion, the Assessment Services group evaluates products, systems, and services not covered by our Listing and Certification Services. We undertake special testing, research, demonstration projects, and studies for industry, service companies, government, and individuals with health and environmental concerns. Services Can Do For You! Write or Phone for Free Information: * Assessment Services Brochure • NSF Facts Brochure are carried out in accordance with US Food and Drug Adminis- tration standards. Disease Control to assist them in protecting passengers' health. Agency, we are studying the costs, maintenance require- ments, and effectiveness of various small central systems and point-of-use units to reduce fluoride levels in drinking water. In another project, the solidified product from a hazardous waste chemical treatment and solidifica- tion process was rigorously tested for leaching of hazardous or toxic constituents. Test results were provided to the state regulatory agency reviewing the process. Under contract with manufactur- ers, new products have been tested and evaluated for their effects on various onsite wastewater treat- ment systems. Point, N.Y., uses a bank of com- puters to generate radar signals and visual imagery on a 240- degree screen surrounding a ship bridge mock-up. The facility is used for research on collision- avoidance techniques, control and maneuverability methods, harbor and waterways problems, ship bridge design, and ways to train and certify watchstanders. The contract is for one year, but contains options for up to two one-year extensions. Separators for diesel lube oil and fuel oil as well as for the demin- eralization of lube oils for gas turbines. This very informative book is filled with detailed data, dia- grams of equipment, installation diagrams, drawings, full-color cutaway illustrations, and four- color photographs. Individual units are examined in detail and complete informa- tion is included on the firm's "Centri-Pack" packaged systems which are delivered complete and ready for fast, economical ship- board installation. "Centri-Pack" includes all components neces- sary for full operation already installed on a single sturdy base. Included are the separator, mo- tor, pumps, pre-strainer, thermo- statically regulated pre-heater, motor control and timing unit, supervisory equipment, etc. B&W, Sulzer, Deutz, MWM, Piel- stick, etc. Diagrams and tables are included which contain com- plete installation and working instructions. There is also a sec- tion on the use of future fuels. Naval Avionics Center, Indianap- olis, is the contracting activity (N00163-83-C-0067).